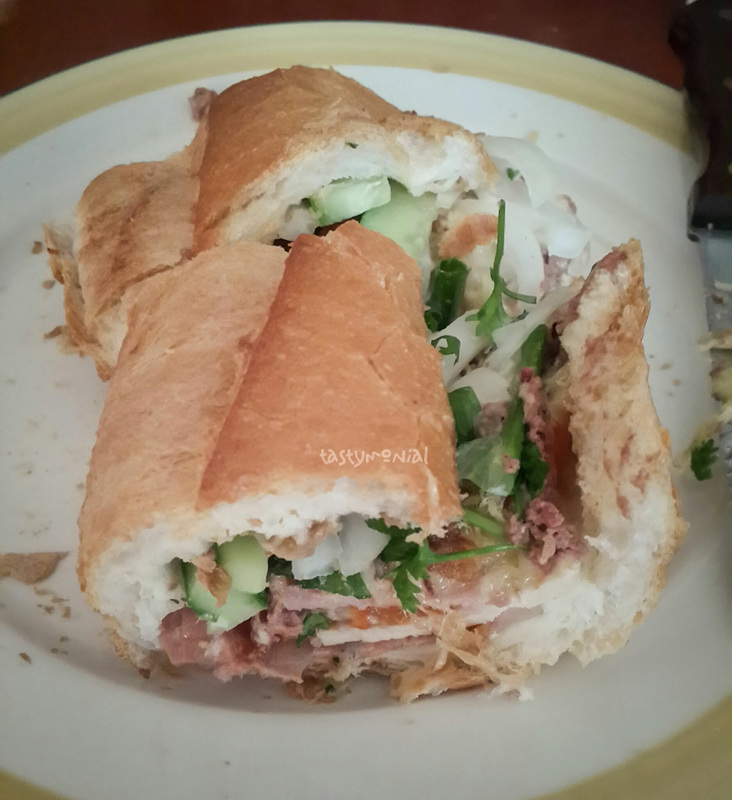 Banh Mi Huynh Hoa – for meat lover! Banh Mi is one of thing I would miss from Vietnam when I left. I like this bread very much, and especially they filled it with meat and vegetables inside. Banh Mi is a Vietnamese Sandwich. The bread looks like French Baguette but they are not the same. I like banh mi better than baguette, because of the crunchiness of the skin and the softness inside. If you are visiting Vietnam then banh mi is one of the food you have to try. There are many banh mi sellers in Ho Chi Minh City. You can find it almost everywhere, on the side of the street or even in fancy restaurant where the price is very high of course. Last week I had visitor and they wanted to try banh mi. I brought them to Banh Mi Huynh Hoa in district 1. It is located at 26 Lê Thị Riêng street. We were just finished visiting the museum and we were hungry at that time, around 3.30 pm. I saw on google that this banh mi opened at 2.30 pm. Good chance to try it! When we arrived there, there were several people in queue. But don’t give up by the sight! They were very fast in preparing and serving the banh mi. A guy asked me in Vietnamese how many banh mi I want to buy. I said two. Their price is higher than other banh mi seller. Usually the price ranges from 10.000 vnd to 17.000 vnd, but this one costs 32.000 vnd. I saw many kind of meat in their cart. I must say this is the best banh mi I’ve ever eaten in Saigon. It had a lot of meat, perfect seasoning, good amount of vegetables as well. Just perfect! I will buy this again (and of course will recommend it to my friends). Anyway… this banh mi is a must-try. The price is worth it for that much meat filling. They are open from 2.30 pm til 11.00 pm. Will go there again next time.